Jerome Fork of the Mohican River helped bring civilization to Ashland County. For some, it now provides a temporary escape from civilization. Native Americans lived, hunted and grew their corn along its banks. The European immigrants who followed also took advantage of the river, damming it and building mills to power their machinery. Today, three Ashland County Park District parks are located along Jerome Fork and a fourth is just downstream on Lake Fork. Two of them are linked by canoe and kayak access. Jerome Fork begins less than three miles northeast of Ashland at the confluence of Leidigh Mills Creek and Orange Creek. From its point of origin south of Orange Township Road 1054, this straight and narrow stream flows nearly 15 miles to its confluence with Muddy Fork, which marks the beginning of Lake Fork of the Mohican River. Jerome Fork used to be considerably longer. The stream once meandered wildly, creating oxbows at some points. However, it was dredged and straightened twice in the earlier part of the Twentieth Century to drain farmland more efficiently. Jerome Fork remains exceptionally straight to this day. An interesting side note: According to records provided by the county engineer’s office, landowners who directly benefited from the dredging used to be assessed for the cost. These days, taxpayers foot the bill. Jeromesville resident and historian Kenny Wise recalled that the second round of dredging was going on in the 1930s, when he was a child. The contractor used a huge steam shovel to deepen the channel. Five years ago, a contractor cleared logjams from 40 linear miles of Jerome and Muddy forks, which helped farmers and made life easier for paddlers. Wise also recalled that Jerome Fork used to be considerably deeper. Over the years, runoff has filled in the channel, making it a very shallow stream most of the time. Wise grew up at a time when Jeromesville was basking in the prosperity of its founding fathers. A mill established there in 1836 was still in operation when he was a young man, but it was no longer powered by the river. 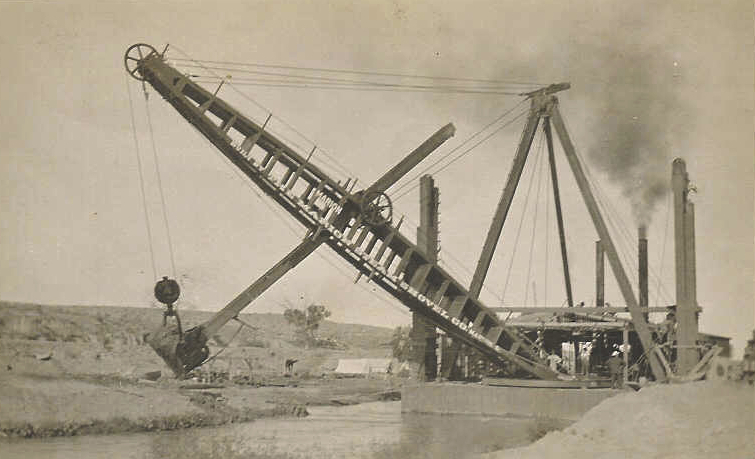 After flooding in 1910 caused Jerome Fork to back up, the U.S. Army Corps of Engineers destroyed the dam that had impounded water to run the mill. According to information provided by Wise and his daughter, LuAnn Graser, the Corps provided funding for the mill’s owners to power it with a gasoline engine. Wise said the gas engine was replaced in 1925 with a diesel-powered model, which was built in Mount Vernon by Cooper-Bessemer, a prominent manufacturer of marine engines. The mill closed for good in 1952 and the building was razed in 1967. A Cambridge resident took ownership of the diesel engine that had powered the mill for more than a quarter-century. “We’re trying to get the fellow who has it to bring it for the 200th next year,” Wise said. Jeromesville will celebrate its bicentennial in the summer of 2015. The Ashland County Park District is doing its part to preserve Jerome Fork’s heritage by helping a new generation connect with the river. Between 2006 and 2010, the Park District acquired land and established three parks along Jerome Fork and one downstream on Lake Fork. At the top of the string, starting upstream, is Audubon Wetlands Preserve north of U.S. 250 on Township Road 743. Next is River Walk Natural Area on County Road 1500. Volunteers made canoe and kayak landings there and downstream at Hopkins Landing to facilitate short float trips. Cool Springs Wildlife Conservation Area completes the string just downstream of the Jerome Fork and Muddy Fork confluence. 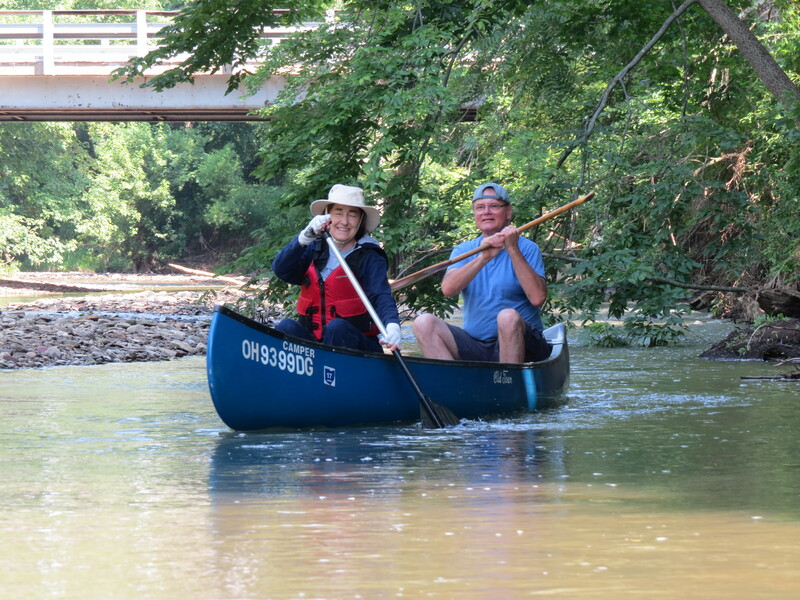 On a Saturday morning in mid July, I set out for a 6.5-mile float from River Walk to Hopkins Landing with Park District volunteer Louise Conn Flemming-Dufala and her husband, Jim Dufala. It’s an easy float, which usually involves some wading at normal water levels. This stretch can be paddled with little or no wading if the river is slightly higher. However, at high water levels, it can be dangerous. When the river was straightened and dredged, it created high banks on both sides. A river with a natural meander typically has a low bank on one side and eddies at the bends, where paddlers can avoid being swept into obstacles or take out and portage around them. With the straightened channel and high banks on both sides of the river, fast current can drive a boat into a logjam or downed tree, making escape difficult if not impossible. The straightness of Jerome Fork diminishes its natural beauty somewhat. There’s something about the constantly changing scenery of a meandering river that adds to its enchantment. Jerome Fork lacks that, except in spots where the natural meander has started to return. 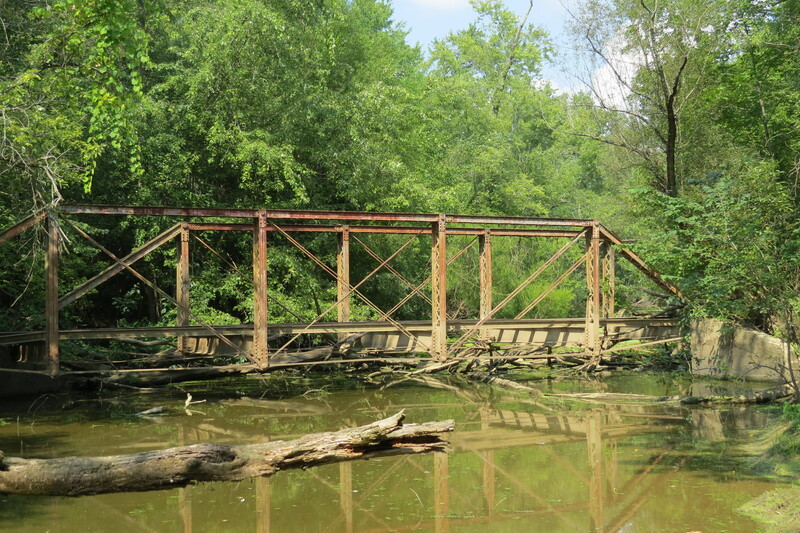 An old iron bridge spans the old Lake Fork channel at Cool Springs Wildlife Conservation Area, one of the Ashland County Park District parks. Mother Nature saved her best for the end of the trip. As we approached the U.S. 30 bridge a bald eagle came into view, gliding high above the tree canopy. A smaller bird — which we were unable to identify — harassed the eagle, trying to drive it out of its territory. The smaller bird gave up after the eagle eluded it by performing some impressive aerial acrobatics. Park District volunteer Eric Boyer saw a lot more wildlife the following day when he kayaked from River Walk to Hopkins Landing. Paddling solo is the best way to see wildlife. Boyer reported seeing more than 20 deer including three in the river, several wood ducks, great blue herons, kingfishers, shore birds, a hooded merganser, a mink, raccoon, muskrat, several large fish jumping out of the water, a soft-shell turtle, snapping turtle and — at the last bend before Hopkins Landing — a beaver. Prior to the 20th Century, the 6.5-mile River Walk to Hopkins Landing trip would have been considerably longer. The natural meander of a river can add miles to its overall length. Some literature on Jerome Fork has also added miles — about 10 miles. 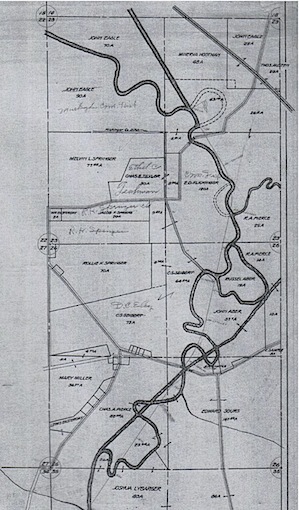 The booklet “A Guide to Ohio Streams” edited by Randall E. Sanders of the Ohio Department of Natural Resources lists Jerome Fork at 24 miles long. That figure also appears in the Gazetteer of Ohio Streams, published by ODNR in 1954 and updated in 2001. Douglas Leed, spokesman for the Ohio Division of Watercraft said in an email that the reason for the discrepancy is unclear. ODNR is taking steps to address the inconsistencies in state documents. It’s possible that, prior to being straightened, Jerome Fork would have been 10 miles longer. Although that might be something of a stretch.